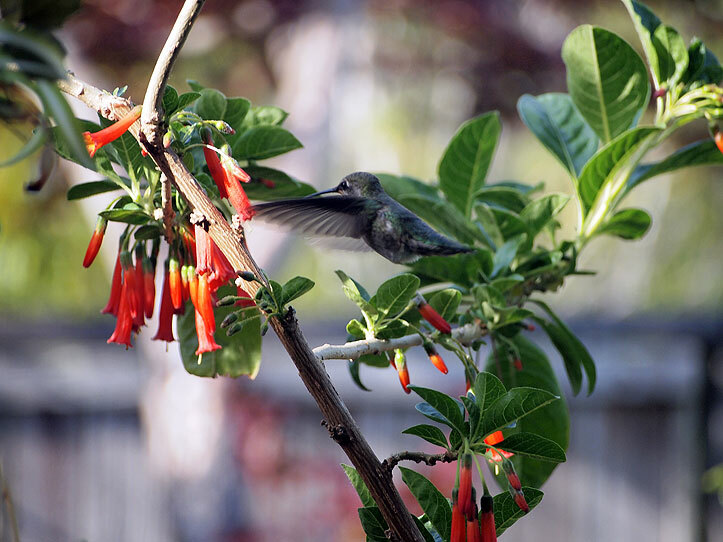 The iochroma is flowering, and that means the hummingbirds are back. I like to photograph them, in part because this particular iochroma is right outside my study window, and it makes a nice diversion from my literary work, and also because it’s challenging to freeze the speedy little hummers in photos. But what kind of hummingbird is this? I’m not the bird identifier that Charles Hood and Jonathan Franzen (my companions on a Catamaran catamaran a while back) are. I get frustrated because bird books tend to feature adult males. I suspect this one might be immature, or maybe even a female. In any case, try as I might, I cannot find a reference to California hummingbird that has a yellow patch on its head. 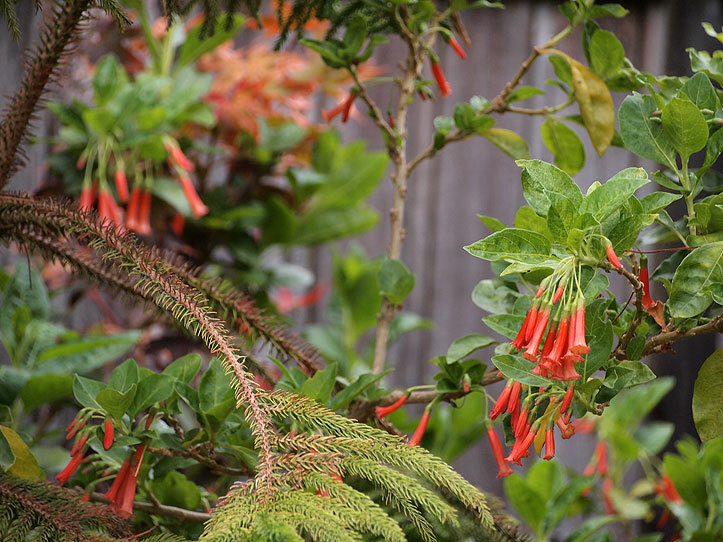 This hummingbird loves the iochroma. Iochroma is a Central or South American plant unrelated to fuschia but similar in appearance. The flowers can be blue, purple, red, yellow, or white. It does quite well in our region. Annie’s charges about $10 for a seedling in a four-inch container. But the plant can be propagated from greenwood cuttings in late spring or from semi-ripe cuttings in summer. It should be top-dressed in spring. Pinching young plants will enourage bushiness. This one is in a container, so it requires water once or twice a week in the dry season. 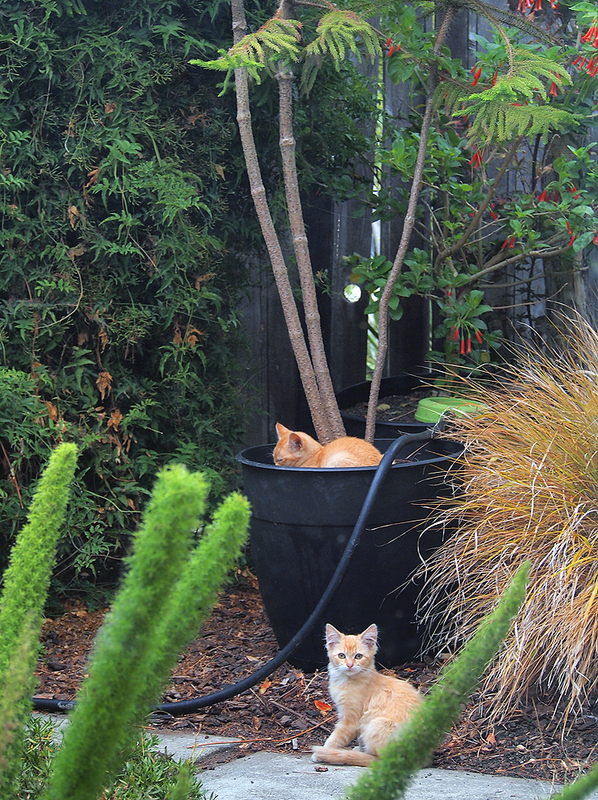 I have another in the ground, which is larger — at least nine feet tall — and requires no maintenance at all. All parts of the plant are poisonous. But not to hummingbirds.